Cases of infectious syphilis increased by 15.2 percent, from 981 cases in 2016 to 1,130 cases in 2017. Last year, the overall rate of early syphilis was 34.1 cases per 100,000 persons, a 14.4 percent increase from 2016. The rate among men was 22.4 times the rate among women, and 85.5 percent of cases were in gay and bisexual men. The highest rates were observed among men aged 25 to 34 years and men of color. Rates among black/African-American and Hispanic/Latino men were 92.1 and 82.8 cases per 100,000 people respectively, compared to a rate among white men of 53.0 cases per 100,000 persons. Chlamydia cases also increased by 10 percent—from 18,904 cases in 2016 to 20,801 cases in 2017. The overall rate of chlamydia was 628.5 cases per 100,000 people, a 9.3 percent increase from 2016. Chlamydia continues to be the most common reportable STD at the local, state and national levels. The rate of chlamydia among women was 1.6 times the rate among men, and the highest rates were reported among women between 20 and 24 years of age. Cases of gonorrhea increased by 19.1 percent, from 4,992 cases in 2016 to 5,947 cases in 2017. The overall rate of gonorrhea was 179.7 cases per 100,000 people last year, an 18.4 percent increase from 2016. The rate among men was 2.7 times the rate among women and is also increasing at a faster rate. Between 2015 and 2017, the rate of gonorrhea among men increased by 57.6 percent. Of particular concern is an alarming increase in the number of cases of congenital syphilis nationwide and in California. Syphilis that is transmitted from an infected mother to her unborn child can result in multiple birth defects and fetal death. Although San Diego County has not seen the increases in congenital syphilis cases observed in other parts of California, and most syphilis cases are reported in men, cases of syphilis in women are being closely monitored by public health officials. What can you do to lower your risk of contracting a sexually transmitted disease? 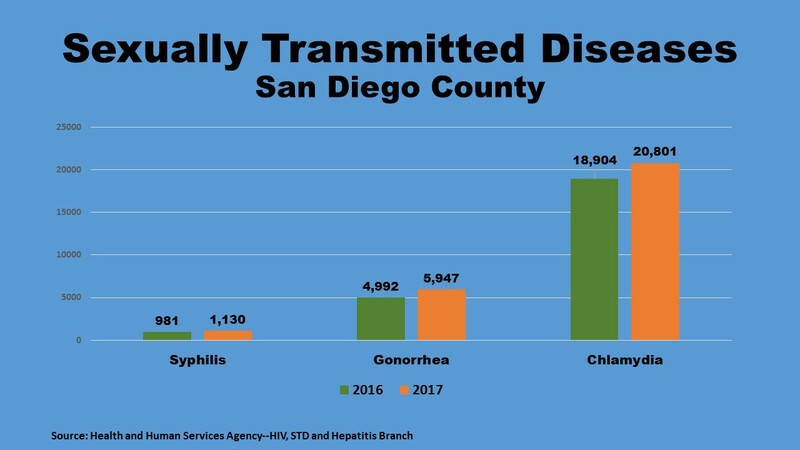 Preventing sexually transmitted diseases is part of the County’s Live Well San Diego vision, which aims to improve the health and well-being of local residents. The County has implemented programs, such as Don’t Think, Know., a free home testing program for gonorrhea and chlamydia available to women 25 years old and younger. The program can be accessed by visiting DontThinkKnow.org or by calling (619) 692-5669 (619-692-KNOW). The County also operates a program that screens female youths entering San Diego’s juvenile detention facility for these infections and provides treatment to those who have a positive test. The County also operates four STD clinics, which offer testing and treatment for most STDs regardless of a patient’s ability to pay. For more information about STDs and testing services visit STDSanDiego.org or call (619) 293-4700.